If you’ve been writing blogs, answering questions on social media, and you have your product details available from your website, you’re already doing the core stuff of inbound marketing. If you’re creating interesting content that engages your potential customers instead of blasting them with branding messages, you’ve been doing inbound marketing all along. 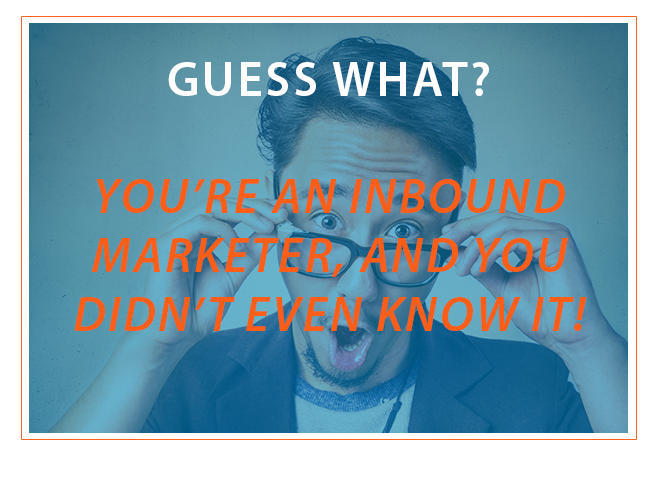 Don't worry about being an inbound marketing expert. In this blog post we're going to explore what the tenets of inbound marketing stay away from, what they include, and how you can master inbound marketing strategy. With the power of the internet, you now have the time and freedom to say whatever your audience needs to hear and know about your product. You can reach new customers almost anywhere, and people now respect clear, helpful information over sensational brand messaging. You still have to keep it interesting and entertaining, but with inbound marketing, people should leave your message feeling like they have a solution to their challenge. For the marketer, providing this solution right when the audience needs it will take a potential customer further along the sales cycle than when they started. The relationship will be stronger. Your audience will progressively know, like, trust, buy from, and refer to you. The best marketers already know that this is the ideal method and path to convert, and inbound marketing makes it a core practice. Because inbound marketing is focused on the consumer, knowing what you should create to market to them starts by identifying your potential customer through a buyer persona. You won’t have to guess or force a marketing plan because your strategy will build around the reasons your potential customer would seek out your answers and need your product. If you already focus your marketing efforts on giving your audience an answer to their questions, then inbound marketing’s personas will really make sense to you. Inbound marketing uses blogs, ebooks, email, targeted pay-per-click, and social media as means to reach exactly the right audience with a meaningful message. You probably even noticed that these are some of the most cost-effective marketing tactics, too, which makes inbound marketing even better for companies that simply don’t want to engage in an expensive advertising battle with their competition. Let’s be clear first: Just because you have some outbound marketing does not mean you are not doing inbound marketing too! With inbound marketing, it is helpful to know that your messaging aligns, and what inbound marketing really tries to avoid so that everyone has the best experience. Most email, print, radio, TV, and billboard ads don’t have the time to provide real information about the product, so they just try to hit you fast. Because there’s often no substance, it’s too easy to make a conventional ad, and the result is that there are too many ads noisily fighting for our attention. Inbound marketing really is best for both the business and the consumer because it avoids creating distraction and noise. These days, the consumer has all the power. Your audience can potentially avoid or tune out a lot of marketing messages, and with the Internet your audience can search out information they want without being limited to what is provided by the biggest companies, as in the past. Inbound marketing makes enticing, useful content that the consumer will choose to engage with, which turns the weakness of conventional marketing into a strength for inbound marketing. One of the most important things is that inbound marketing never encourages marketing or sales tactics that put the short-term ahead of the long-term. Making a customer continually happy with their purchase decision is crucial to lasting success; inbound marketing always avoids high-pressure methods that leave your buyers with a sense of doubt or regret. You Don't Need To Be an Inbound Marketing Expert To Reap The Benefits. Here's Why! So you may have thought that you couldn’t do inbound marketing, or you were too old, or you got left behind the movement. None of these are true for any real marketing professional. Inbound marketing simply took the best parts of the internet marketing movement and focused on them, leaving the disruptive parts of marketing behind! Look at how large companies like Dell, Starbucks, and Cisco are using educational content, social media, and custom email to leverage inbound marketing to stay on top of their competitive industries. If it works for them, it can work for you! If you’re still on the fence, measure the cost effectiveness and customer satisfaction of your inbound marketing vs. conventional marketing over time. Most companies find that they get much more bang for their buck with inbound marketing. Consider that inbound marketing may not always be optional: it’s quickly becoming the standard for modern marketing. With inbound marketing continuing to grow to take over the majority of successful marketing efforts, it makes the most sense to get fully on board early rather than switching reluctantly as a reactive measure! Inbound marketing really generates the best results when it’s executed strategically. Set goals for your inbound marketing strategy. Identify exactly how your company is performing in terms of revenue in the present, and perhaps include snapshots of the past to see which direction your company is going. Create a SMART goal that is a realistic improvement on your trajectory, and determine what kind of actions you’ll have to take to see that goal achieved. Create a process for how you will guide your audience to becoming a customer. Never assume that your audience will move straight from exposure to a purchase decision, as nice as that would be. As an example: show how you will attract viewers to your site, then engage them with your blog, gain their trust with your content offering, retain them with your emails, and convert them with your sales options. Each of these phases should lead one into the other, or else you don’t have a process. Measure results over time. Keep a spreadsheet or metrics page of exactly how many people come to your webpages each month, and then track how many people continue to interact with your company via downloads, emails, and return visits. Track each phase of the sales cycle in terms of people and mark the percentages that move on to the next stage. Optimize your system for future use. Create two different calls to action on the same blog, for example, and measure which one performs significantly better. Observe which posts and pages get the most views, and which content offering is most frequently downloaded before someone becomes a customer. Whatever the strengths are for those best performances, leverage them through your other content, or optimize to have them more prominent. The inbound marketing community is huge, so you’re never on your own. There are plenty of resources to walk you through the basic and intermediate work of creating an inbound marketing strategy. Want to stay on top of the best inbound marketing strategies and latest best practices? Subscribe to our blog and receive all of our inbound marketing knowledge, right to your inbox.